I knew that following God would not be easy. I knew that the life he called me to would be difficult. And I have been through enough difficult circumstances to remind me of that should I ever forget. Pastors and Christians who want us to believe that if we follow God it will all work out do us no justice. History is full of millions of people who were probably a lot more devoted to God than I am, who lived miserable hellish lives, and died in torture, mostly for being born in the wrong place at the wrong time. Organizations like Voice of the Martyrs exist to help remind us of that fact. I knew following God would not be easy. I believe in order to be who God truly desires me to be, I will have to face some difficult circumstances. But this time is different. When I started on the path that has gotten me to where I am now, I knew it would be difficult. I knew that God would lead me through a dark tunnel, that I would have to trust Him, but in the end He would lead me through to the light on the other side. So I started walking down the dark path with him, looking for the light on the other end of the tunnel. But now I don’t feel like I am in a tunnel. 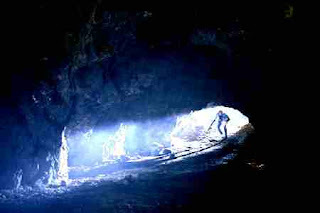 Instead I was lead into a cave by God, and it feels like he has abandoned me here. Now I am surrounded by darkness, and I have hit the back wall, the dead end of the cave, and God and the light are nowhere to be found. I stumble around in darkness so thick I can feel it, and it is closing in and crushing me. I can feel the wall, and I am desperately trying to find the light, to see any small glimpse, some pencil lead sized dot of hope, but instead darkness is every where I turn. This tunnel turned cave mocks my faith, and me, slowly but steadily crushing me in darkness with every passing hour. I have tried shouting Romans 8:28, Jeremiah 33:11, vainly dreaming in my depression induced delirium that they might be some sort of magic phrase, God’s version of open sesame, and that the cave wall would turn into doors, and I would find the light. Instead the words bounce off the indifferent pitiless stonewalls and come back to me, mocking me, that I could ever believe such foolish statements. My fight is gone, my strength and perseverance are gone, and my will to live is going also. I want to believe that God will get me through, I do believe that God will get me through. With every noise and creak and sound, I believe it is the rescue coming. But it never is. “I have never seen the righteous forsaken...” said the psalmist. I hold on to those truths will all I have. Because it is all I have. Still I sit in the dark. Alone. Cold. The paradox of Christian faith has always intrigued me. Death from life. Joy from sorrow. Glory from shame. And now I can feel it. With every passing moment my faith doubts more and more. It seems like God still has not come through. With every passing moment, the odds increase that God will break through, will rescue me, will redeem me. My doubt and my faith both grow stronger as the darkness continues to come. I know that God will come through. He always does. It is rarely my time or my plan, but God comes through, the walls do disappear and the light at the end of the tunnel reappears. He did it for Job, for David, for Joseph, Jacob, Moses, Gideon, Samson, and on and on and on. To quote a favorite philosopher, "If we know no dryness, how can we know the rain?" The darkness only makes the light that much brighter.